Fine Art Shippers is a well-established art logistics company headquartered in New York City. Our professional services include everything from art packing and crating to art installation and white glove art delivery. For today, we successfully serve many reputable art galleries, auction houses, museums, antique dealers, and artists all over the East Coast, and we also have regular art shuttles that go up to the Midwestern United States, covering Ohio, Indiana, and Illinois. However, it is needless to say that Fine Art Shippers is not the only reliable company offering high-quality art logistics services. In this blog post, we want to tell you about Art Delivery Service, an amazing fine art shipping company based in Santa Fe, New Mexico. While Fine Art Shippers mainly operates on the East Coast, Art Delivery Service covers all the Southwestern Region of the United States. 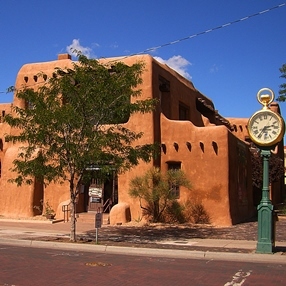 Founded in 1998, this wonderful company now offers a full range of specialized art packing, crating, shipping, and delivery services, working with galleries, dealers, artists, collectors, art consultants, and private clients in New Mexico, Oklahoma, Texas, Colorado, Arizona, Nevada, and California. It is also impossible not to mention that Art Delivery Service offers a variety of art shuttle option using their own fleet of customized shipping trucks, including regular shuttles going from Santa Fe to the East Coast of the United States. Art Delivery Service is indeed a great company you can always rely on when it comes to handling and shipping fine art and antiques!